We are excited to announce our most recent commercial design collaboration with CINSA — part of Grupo Industrial Saltillo —, a company known for its more than 80 years offering products for the Mexican kitchen. Product design for the Mexican kitchen. The project consists of a line of cooking products under the brand INTERCUISINE, the high-end brand of CINSA home division. 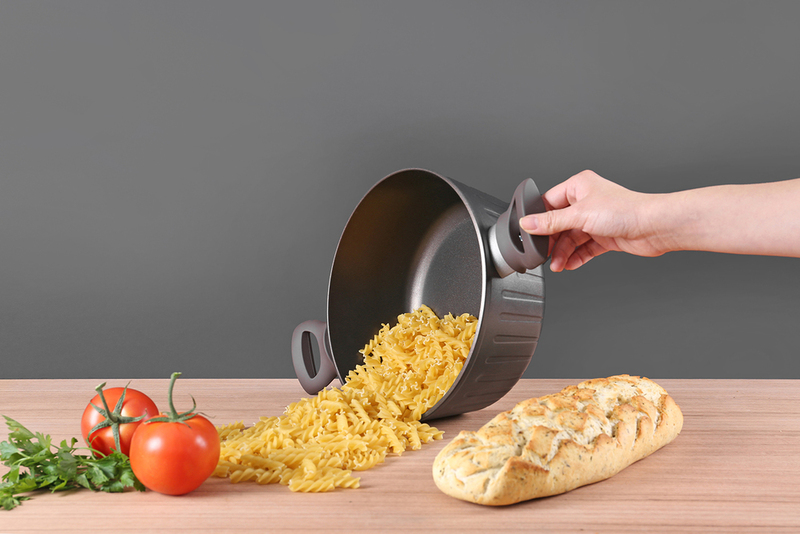 Produced with cold forging aluminum, the final result is a cookware collection with a technical, friendly and modern personality. The collection consists of containers such as pots and pans of various sizes, both with glass lids and Bakelite accessories. One of the most evident design features of Inspyro are the smooth vertical channels around its body, which meet technical requirements to evenly distribute the heat when used. Another important feature is the change in thickness on the walls and at the bottom of all containers, a feature that could go unnoticed to the naked eye, however, thanks to the press forging process is possible to vary the amount of material required in different areas of the product, making some parts of the shape robust and resistant or thin and detailed. Invariably when speaking of Inspyro, is necessary to talk about the manufacturing process presented by the client, since cold press forging is 3500 tons of hydraulic pressure on an aluminum disc in order to create something attractive and functional. Been this a superior production process due to its capacity to achieve products in one piece with superior mechanical properties than others processes, taking full advantage of the energy and raw material used in each product, minimizing production waste. Glass lids and bakelite accessories detail.